The singer turned actress has gone through some changes that no diet or lifestyle choice can be held responsible for. That said, we would love to know if there is a natural way to go from an A to C cup overnight! In her early days as a starlet, Christina was a tiny lady in all aspects of the word. She quickly joined the troops of female celebrities giving themselves a boost, through surgery, it seems. We’re in absolutely no way judging Xtina for undergoing breast augmentation, and think she looks fab either way. At first, it seems she had a breast augmentation – a form of plastic surgery which increases breast size, as well as changing the shape and positioning on the body. After giving birth, her breasts did naturally expand and it’s believed that she then had reduction surgery to take them back to a more ‘natural’-looking size. Breasts do change shape throughout a woman’s life, constantly altering slightly based on hormones, lifestyle and diet choices. Either way, we’re pretty sure she had a hand in it all, and not from Mother Nature! Lip-fillers are incredibly popular, too, promising to give you a sexier, fuller smile. 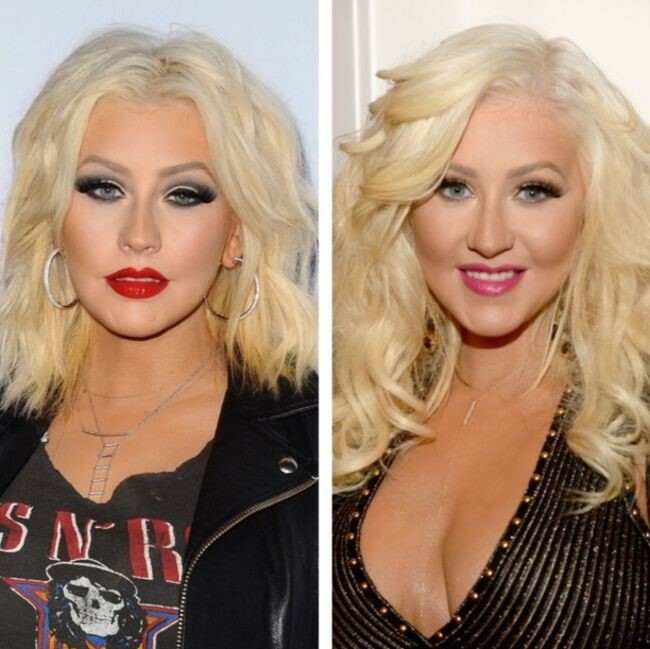 It appears that Christina opted for this type of cosmetic surgery as part of a package deal! Luckily for her, the effect is fairly natural and suits her face. Other celebrities who have gone under the knife have not been so fortunate. The ‘Bride of Wildenstein’ is one of the latest celebs to have experienced what can happen if surgery doesn’t go 100% your way. Whilst the surgery was her choice, we think she looked better before – sorry, Jocelyn! The infamous ‘nose job’ is yet another household term in Hollywood, with many celebs rumored to have turned to this type of cosmetic surgery to work on their facial features. Professionally known as ‘rhinoplasty’, nose jobs include the removal of facial tissue and cartilage to alter the appearance of the nose, be it shorter, slimmer or svelte that you’re after! Christina appears to have had nose surgery; the shape is slightly slimmer if you look closely. Her cheeks, too, seem to have been worked on and have a fuller appearance than they did in her youth. Nose jobs can go horribly wrong – Lil Kim, we love you, but your natural nose was so much nicer! We want to make it crystal clear that we are in no way judging Christina for the choices she’s made regarding her own body and appearance – it’s totally her choice what she does! There are many reasons to undergo surgery, and you never know someone’s true motive for going under the knife. Some people choose to get surgery to correct birth defects, including cleft lip palates and birthmarks – whatever makes you feel more comfortable! For others, cosmetic surgery can be restorative after an accident that effects skin tissue and leaves burning or scaring. And, in many cases, it’s for aesthetic purposes. Most of us are hung-up on at least one aspect of our appearance, and some of these insecurities are easier to ‘fix’ than others. Gym, diet and lifestyle can be helpful in altering certain aspects of how we look, especially given that a high proportion of our bodily confidence comes from our shape and size. Certain parts of how we look are not so easily to alter, however, which is why surgery can be the ideal solution for some of us. Too many people spend time letting their hang-ups hold them back from doing what they really want. Life is too short to be spent sitting indoors and hiding yourself from the world. Cosmetic surgery can be a great way to improve your self-confidence if you genuinely see no other way to get around the feelings of insecurity you’re experiencing. Nose jobs, lip fillers and breast augmentations are all ways to help boost your confidence if you have a certain facial problem or body area that you really want to change. And why not? If you have the funds, and bravery, to go under the knife, go for it! So, why the silent treatment, Xtina? We understand that it must be hard to be honest about your appearance when you’re already under so much scrutiny, but there’s no judgment! We, along with an awful lot of people out there, believe that your body is yours to do whatever you want with. Tattoos, hair dye and makeup are all ways that we alter our image, so why should surgery be any different? Sure, it’s normally a permanent change, but if it’s something you feel strongly enough about to be operated on, you’re pretty likely to be happy to commit to if for that long! Christina, let it be known that we will always love you for your sass, and for inspiring a generation of young women to be independent and full of ‘girl power’, whatever you do or don’t do with your face! We believe that it is 100% your choice to have surgery or stay natural, and to keep quiet about it if you want to, we just want you to know that you’ll always have our support. ‘You are beautiful, in every single way’ – remember?